We don't really need any excuses to go to the beach, but this is a great reason to go. 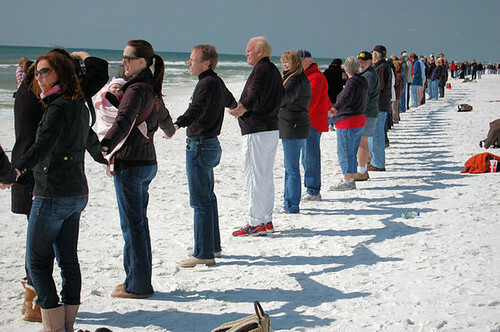 Hands Across The Sand is a movement that brings together all different kinds of people to join hands in the name of protecting our coastlines, oceans, and marine wildlife, and protesting offshore oil drilling. In light of the recent Gulf oil spill disaster, partaking in this peaceful protest is more relevant and important than ever. Find a beach near you and join one of the organized events, or organize one yourself. Help set a world record and join the movement tomorrow, June 26!